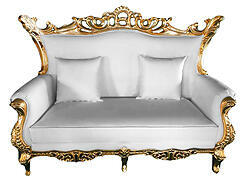 Feast your eyes on the subdued wild elegance of the Terra luxury love seat. Witness the mesmerizing attraction as your attention leads you to the ornate solid wood frame hand-carved out of birch wood. The luxurious solid wood frame of this modern arm chair is then stained with gold leafing and sealed as if crowning the white leather upholstered seats and backing as its king. The Terra luxury love seat will not only transform any living room into a majestic kingdom but will invite exciting functional contemporary art into any living room or commercial space to be used as a chic lounge chair or create a secluded haven to enjoy the rest and relaxation deserved after a long day. Dimensions: 65.7L" x 37.4W" x 47.2H"
All Joints are corner blocked, doweled, glued and finished with support screws. Seats use 8 gauge wire w/ heavy metal Leggett and Platt upholstery clips. Backs use 11 gauge wire w/ heavy metal Leggett and Platt upholstery clips. 1.8 density, 22 pound Indentation Load Deflection foam core w/ 2 ounces of high density fiber wrap. All Fabrics used are an assortment of fibers, both man- made and natural. Fabrics are backed to minimize stretching.